This page tries to illustrate where we are now in the - quite complex - Process of this Project. Competency Study: Preliminary work with focus groups and an extensive review of literature (see here) was necessary in order to define the essential competencies required of any newly certified professional psychotherapist. The EAP Member Organsations & Individuals, National Unmbrella Organisations (NUOs) and European Wide Organisations (EWOs), European Accredited Training Schools (EAPTIs), and the European Certificate of Psychotherapy (ECP) holders, form a key part of this group and every effort will be made to ensure that this survey is as wide and as diverse as possible (see Participants List here). We will also invite participation from individuals and organisations in related fields. (This process started in January 2011 and finished in September 2012): See also item 3 below. Analysis and Expert Panel: Having surveyed the "stake-holders" - EAP psychotherapy national and modality-based associations, psychotherapy training schools (EAPTIs) and individual ECP holders, we performed a quantitative and qualitative analysis of these results and then passed these over to an Expert Panel, which reported independently. We have now finished the analysis of that PAS data (Dec. 2012): you can view the Quantitative (Statistical) Analysis Report, here and the Qualitative (Thematic) Analysis Report, here. These reports have now gone forward to an Expert Panel, which has recently reported (here). The Working Group has made a penultimate report to the EAP Governing Board (Feb. 2013) here. The (draft) Core Competencies have been developed and have been displayed on the Project website since July 2011 in all 13 Domains. Practice Analysis Survey (PAS) forms have been developed and are downloadable (in MSWord .doc format) from the website for the Core Competencies in each Domain. All EAP Member Organisations (NUOs, NAOs, EWOs, EWAOs, and OOs) and European Accredited PsychotherapyTraining Institutes(EAPTIs) as well as EAP Individual Members and ECP Registrants have been informed about the Project and have been iinvited to become Participants in the Project. Currently (Feb 2013) there are about 100 Participants on the Participants List (here). All Participants have been encouraged to start filling in the PAS forms. These forms give us direct and detailed feedback as to how relevant, important and frequently used the actual competencies are: this is essential information for the project. It takes about 4 hours to fill in all the PAS forms for the 13 different Domains. Currently (Feb 2012) about 30 Participants have started filling in the forms (getting a Gold Star), and about 20 Participants have completed these (and got 3 Gold Stars!). The next stage of Phase 1 is to have all the PAS forms analysed. We invited students from the Sigmund Freud University and students from another European University to do this: we eventually found two graduates of an M.Sc. course in Psychological Studies at Glasgow University. It was fairly straightforward, but somewhat laborious. It also needed to be done independently of the Working Party, whohad developed the Core Competencies. All comments on the forms (as well as the numerical results) were recorded.We expected this stage to be complete in about Oct 2012 (actually Dec 2012). The final stages of Phase 1 were (a) to hand over the results of the PAS form analyses and the Participants' comments (which you can see here and here) to an Expert Panel. This consisted of Distinguished Research Professor Emeritus Leslie Greenberg, Dept. of Psychology, York University, Toronto, Canada; Dr Jaap van Lakerveld, Head of PLATO, Social Sciences Research Dept. of University of Leiden, Netherlands; and Dr. Ken Evans, Past-President of EAP and Visiting Professor Psychotherapy University South East Europe. From their own expertise, they reported back independently. Their reports are available here. The Core Competencies were then moderated into their (hopefully) final form: the Revised Core Competencies (available here) (to be voted on in Moscow, in July 2013) (see Diagram below). However, before this happens, if a voting member organisation of the EAP wishes to make any amendment to these revised Core Competencies, they will need to register this amendment with the EAP Head Office before 31st May, 2013. Amendments get voted on first, and then the final (rvised) Core Competences will be voted on. Having established the essential basic or Core Competencies, we need to develop the various 'sets' of Competencies that are 'Specific' to a particular method or modality, or 'Specific' to a particular country. One thing is certain, we will be asking that the submissions from the EWO/EWAO or NUO/NAO have already been circulated to all members of that organisation and that sufficient feedback has been received, via a PAS form, or similar. We will need to see these feed-back forms to ensure that there is a basic agreement from within the modality about the Specific Competencies. Having established the essential set of basic Core Competencies, and also the 'Specific Competencies', relating to a particular modality of psychotherapy or country, we can make a start to develop Phase 3: the Specialist Competencies. Again, this can only be done by small groups of people with particular experience of that speciality, and some of whom would need to be reasonably familiar with the Project (i.e. have already registered as a Participant, and have already been engaged in filling in the PAS forms, etc.) We may have to revive some of the EAP Specialist Working Groups - psychotherapists working with refugees; or working with children; or working with people with learning disabilities; or working with people in trauma; etc. or training, supervising, research, management etc. One thing is certain, we will be asking that the final submissions from these Specialist Working Groups will have already been circulated to all members of those organisations or working in that speciality, and that feedback has been received back from them, via a PAS form, or similar. We will need to see these to ensure that there is basic agreement about these Specialist Competencies. Once the Core Competencies (Phase 1) - and Phase 2 and Phase 3 - are finished; we hope that the Participants will be interested enough to continue working with the Project and developing the Knowledge and Skills Framework (i.e. what is necessary in terms of studying and experiential work to fulfil each criteria) and what are the Assessment Criteria of this Competency going to be (i.e. how is the performance of this competency going to be assessed: written work; supervised practice; examination; etc. - and according to what criteria). The timescale for this Phase, Phase 4, is estimated at being roughly 2015 - 2016. 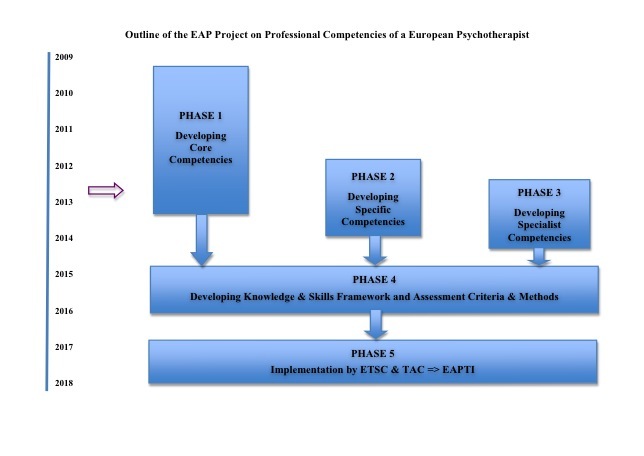 Once Phase 4 is finished; it will be necessary for the European Training Standards Committee (ETSC) and the Training & Accreditation Committee (TAC) to consider exactly how to implement these Competencies so that they form part of the basic training of every new psychotherapist, and therefore that every newly trained psychotherapist is competent to practice, according to these criteria. Once this has been done, there will need to be a considerable dialogue with the European Accredited Psychotherapy Training Institutes (EAPTI) so that these competencies can be integrated into the various different training courses. The timescale for this Phase, Phase 5, is estimated at being roughly 2017 - 2018 and continuing onwards.